It's the Most Wonderful Time of the Year... for Evil! ...and it's up to Nick Saint - Codename: Secret Santa! - the Reindeer Men, their Chanukah allies, and you to save the holidays from their vile clutches! 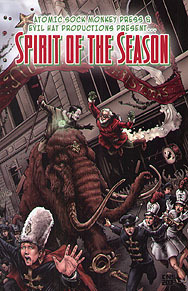 Spirit of the Season is a holiday treat from the minds of and atomic Sock Monkey Press. Featuring characters and new rules compatible wth both Spirit of the Century and Truth & Justice, Spirit of the Season is your ticket to two-fisted holiday pulp adventure.